I also switch out the Sleep charm and the Corrupted Wormhole charm, where i have MF orriented ones on one side, and damage/vit on the other. Yea I haven't seen a eth gotter either...would be sick!!! noob question what should i put on my candlewake runes or jewels? Imo if you are already using set belt, same set chest could beat candlewake. Maybe not in d2stats dps, but extra proc adds easily 5% more total dps. aerial wrote: Imo if you are already using set belt, same set chest could beat candlewake. Maybe not in d2stats dps, but extra proc adds easily 5% more total dps. That is true, but my displayed dsp in D2stats drops by approximately 8,3% when switching to marchosias chest as compared to candlewake ( from 54672 max dam to 50104 max dam) I also notice this in my fautz clearspeeds. They become approx 1min slower, despite having more prox from set. The belt is a different story. With my str craft belt, i have 2,9% more D2stats sheet dps. This does indeed not compensate for the 5% proc. In all my tests, having the belt is more favorable irregardless the chest equiped. 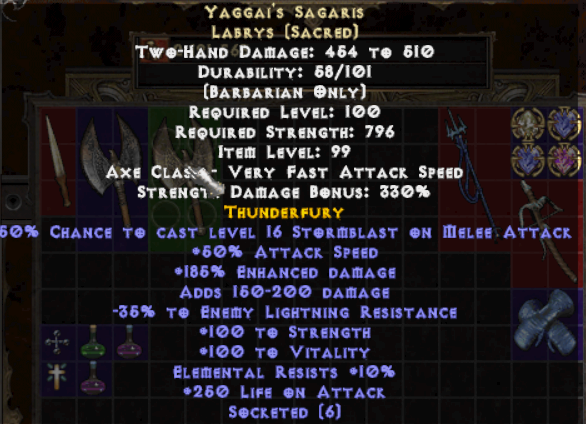 Just found Yaggai's Sagaris (non eth though). Would you guys think it is better than my old craft I posted earlier? If yes what orbs should I put on it? (Besides 1x 15 ed orb)? It says "AR" in the guide, but I thought we don't need attack rating because of the gloves. SU is clear winner here I don't understand why are you have trouble deciding here. Unique has 150-200 damage, which means it adds 150 to minimum and 200 to maximum, which is the same average as +350 maximum. Always look at average damage, not just maximum, we care for minnimum damage same as we care for max. 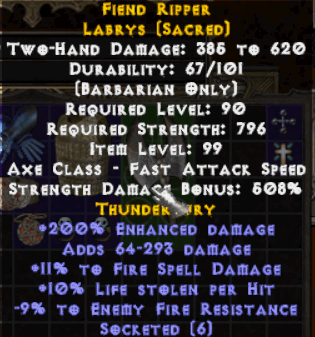 Other stats of unique are vastly superior to craft on top of the damage.